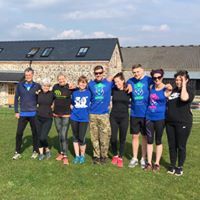 A Boot Camp run by EMpower Gym from Gloucester had a full on activity weekend organised with workouts down the beach, in our field and up on the hills as well as some yoga in Llangennith Hall. The weather was amazing and a great time was had by all the participants. I think they all went home fitter, tired and happy by the sounds of it!